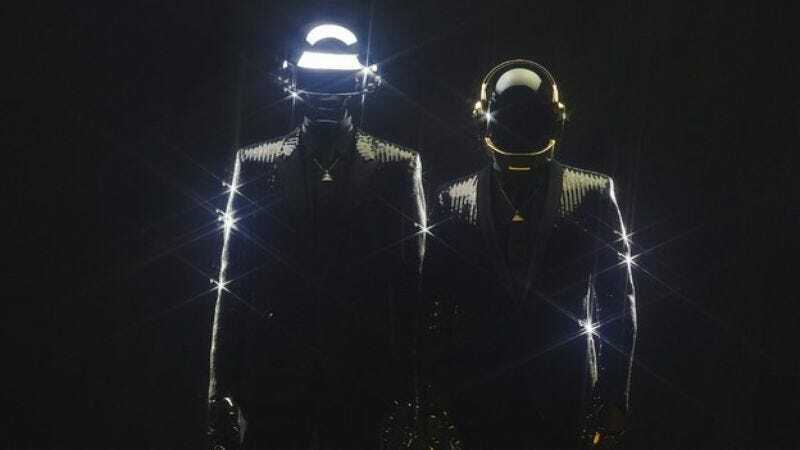 As it turns out, the members of Daft Punk just look like a couple of regular guys under those helmets. Electronic music duo The Knocks posted (and quickly deleted) a pic of Guy-Manuel de Homem-Christo and Thomas Bangalter playing champagne beer pong (!) and eating macarons last night in the Columbia Records offices in New York. The duo was or still is in town for a high fashion photo shoot with model Karlie Kloss. The pic is below for dissection, though this seems like a good place to remind everyone that a lot of great musicians—Bob Dylan, Thom Yorke, Little Richard, and so on—are at least a little weird looking.